Just 1 cup of this cute little pumpkin (including all other winter squashes) is loaded with Vitamin A (60% of DV), C (26%), 5 grams of fiber and plenty of antioxidants, vitamins and minerals. 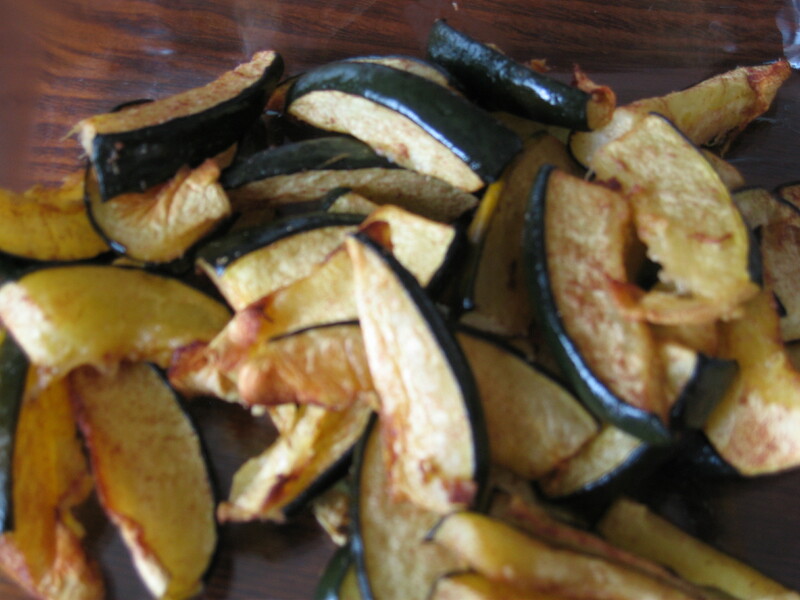 Winter squashes are also shown to reduce inflammation and regulate blood sugar levels…. so how do you cook this delectable veggie? Well, while I love to use butternut squash in soup, I find simply roasting acorn squash in spices and herbs to be warm and comforting too! 1. Pre-heat oven to 375°. Wash acorn squash thoroughly and pat dry. Cut off stem and bottom of squash, then slice in half and scoop out the seeds. You can discard the seeds or roast them. The skin is edible, so I don’t peel it, but you can if you want or if you’ve purchased a non-organic squash. 2. Cut the halved squash in half again, then cut into 1/4″ wedges (I follow the natural grooves of the acorn squash) so they resemble steak-size fries. 3. In a mixing bowl, combine coconut oil and spices (or the herb options with sea salt). 4. Place the acorn squash wedges in the coconut mixture and coat well. Place on a rimmed baking sheet and roast for 40 minutes.